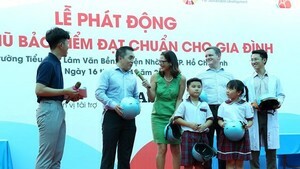 The Ministry of Education and Training along with the National Committee of Traffic Safety and Toyota Company Vietnam have launched “Toyota Traffic Safety Education Program” (TSEP) for primary pupils and teachers. The annual program aims to raise students’ awareness of traffic regulations and safety and driving skills contributing to build traffic culture amongst young people. The program includes two major activities comprising of training driving skills for teachers and primary students in provincial and national level. For instance, driving skill training will be organized in the northern provinces of Yen Bai, Thai Nguyen, Hai Phong; the central provinces of Quang Tri, Quang Ngai; the highlands province of Kon Tum and the southern provinces of Ba Ria- Vung Tau, Binh Duong in February and March. Students will learn basic knowledge and safe driving skills from paint pictures or topics of traffic, musical performance about traffic safety. Teachers deliver lesson on traffic safety and call for students to take part in seminar on teaching renovation of traffic safety in primary schools. Ten cities and provinces will participate in the national level program which will be selected from provincial-level program. It is scheduled the national –level program will be organized in March.